Flying into or out of RDU? GoTriangle's Route 100 bus picks up and drops off at the airport from Downtown Raleigh's GoRaleigh Station every 30 minutes through 6:30 PM and then hourly through the evening. The GoRaleigh Station is a convenient 3 1/2 blocks from the RCC. For additional bus service routes, please visit GoTriangle. The R-LINE, Downtown Raleigh’s free circulating bus, has a stop at the main entrance of the Raleigh Convention Center. The bus runs in a clockwise loop and visits each stop about every fifteen minutes. For hours of service and more information about the R-LINE, please visit the R-LINE website. 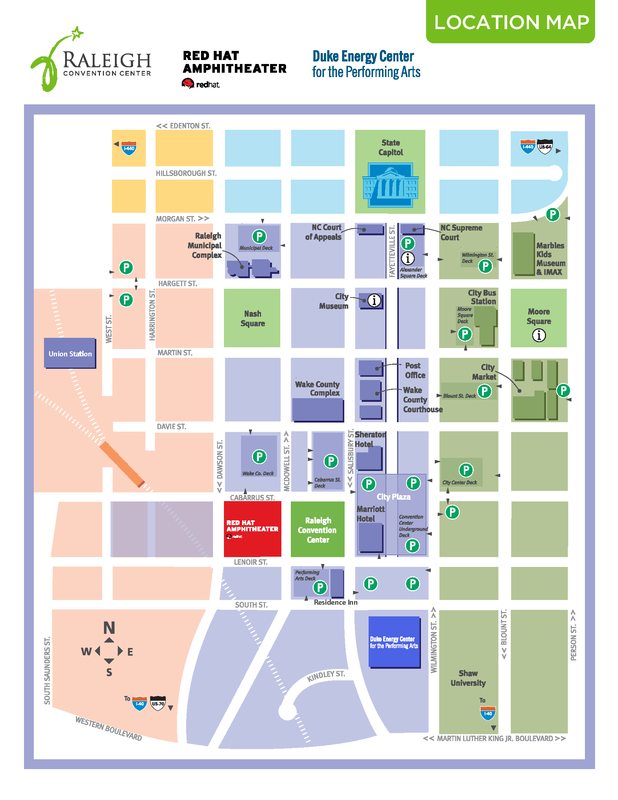 The Raleigh Convention Center is adjacent to the Red Hat Amphitheater and is located at 500 South Salisbury Street, Raleigh, NC 27601. From Points West: I-40 east to exit 298B South Saunders Street. From Points East: 64/264 to I-440 east; merge onto I-40 west and exit at 298B South Saunders Street. From Points South: US-1 north to I-40 east; exit at 298B South Saunders Street. From Points North: US-1 South into the city - left on Lenoir Street. View a map of parking decks in Downtown Raleigh. Accessible parking spaces are available on the first level of each garage. Visit our Accessibility page for more information. Please note that the Raleigh Convention Center does not control the parking rates or maintenance of these garages. Listed parking decks are operated by McLaurin Parking. For concerns with a parking facility or more information, contact McLaurin Parking directly.